People often ask me, what materials and tools I use to create wool paintings. In this article, I’ll explain what’s in my toolbox. Common picture frame with glass. Non-woven fabric (non-slip, soft, with a small pile; you can use fleece, flannel or white cloth towel). Wool of various colors (thin combed ribbon and cardos). Scissors (sharp and comfortable to hold). Tweezers (common type, such as used for the eyebrows). Let’s start with the frame. I use an ordinary photo frame which can be found at any home or craft store or ordered from your local frame shop. Your average frame consists of a backdrop, clear glass covering, and the surrounding edges. I’m avoid frames with plastic covering instead of glass, because, they don’t look as nice in my opinion. But if you have special needs, like an area where it is likely to be broken, you can use plastic. You can also take an unpainted photo frame and paint it in the tone of the finished picture. 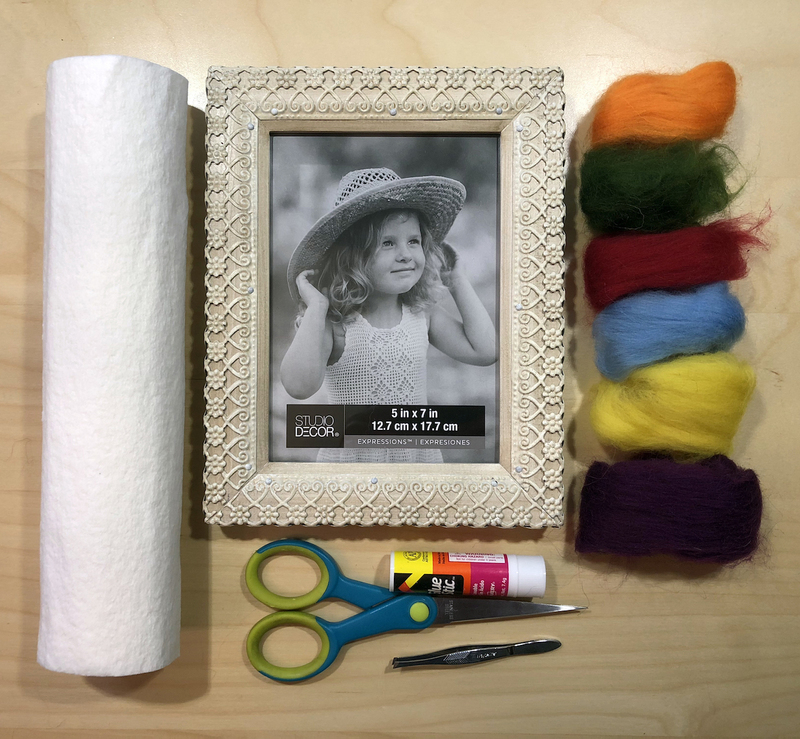 There are many options for your choice in frame, but you need to use frame with clear covering as that protect wool fibers from coming apart. In order to keep the wool from slipping and so it sticks better to the backing, I use substrate. It could be flezilin, plain natural fabric, rough paper, but I prefer to use a simple quilted paper towel. For convenience, you can glue substrate to the backing of the frame, so while you create the picture, the substrate won’t move. But I prefer to not do this, so that I have opportunity to put picture in different frame if necessary. To create a picture, I use two types of wool: combed ribbon and cardos. I try to have a lot of varieties of colors available, because the more color shades I use, the more vivid and picturesque the wool painting will be. Sometimes, to give shine to the picture, I use fibers of silk or viscose. When it comes time to work directly with the wool, I use a sharp pair of good scissors. When you first start making wool paintings, use the scissors that you already own. But as you continue the craft, invest in a nice pair. I experimented with many different types of scissors before I found the most comfortable to work with. When you create a wool painting, you use scissors a lot and not just to cut the wool, but also move the wool around or stab it. You use scissors as a brush to create a wool painting and I discovered that scissors with the sharp point on the end work the best for me. I also suggest to use scissors with a comfortable rubber handle which will protect your fingers from slipping. To lay out the small details of the foreground on the picture, I use tweezers; but other artists just use fingers; everything here is up to the individual and depends on practice. The main tools required for making wool pictures are hands. To work with wool hands should be clean and dry. Also, avoid getting small debris or water on the area where you work. For my workspace, I work over a big table with enough space on it so I can put all the tools and wool I need right in front of me to create the picture. When I craft it, I need to see the whole picture, otherwise I have problems constructing the image. That’s also why I bought a height-adjustable table, so I can work sitting and standing, which ever way my mood takes me. I hope you enjoyed reading about what tools and materials I use to create wool paintings. I would love it if you shared your secrets for creating art with me!